Efforts to restore fish habitat in the Yankee Fork basin, part of a multi-million-dollar series of projects over seven years, are again under way this summer in the Salmon River tributary east of Stanley. The projects are intended mainly to repair damage done by years of dredge mining, which created piles of rock tailings and stagnant ponds along more than five miles of the river during the 1940s and early 1950s. The collaborative effort involves the Salmon-Challis National Forest, the U.S. Bureau of Reclamation, the Shoshone-Bannock Tribes, Trout Unlimited, the Bonneville Power Administration and the J.R. Simplot Co., which now owns mining claims on the dredged area. According to a news release from the Salmon-Challis National Forest, the projects are expected to significantly improve habitat for Chinook salmon, steelhead, cutthroat trout and other species of fish. Bart Gamett, a fish biologist with the Forest Service, said the effort began in 2010 with an assessment of the river, and work got under way in 2012 to channelize some of the ponds along the east side of the Yankee Fork Road near Crealey Creek, about two miles downstream from Bonanza, and create a more natural floodplain. "We've been amazed at the large numbers of spawning steelhead and juvenile fish that are using the new habitat created by this project," Gamett said. This summer, crews are putting logs in that stretch of the river and modifying the channel in two locations to make it more closely resemble natural conditions. "In these mountain streams, large wood historically played a really important role in the development of fish habitat," Gamett said. According to a news release from the Forest Service, over the past 150 years, timber harvesting, mining, road construction and fire suppression have caused large wood abundance in the river to drop far below natural levels. Gamett said that on Friday, workers saw small fish hiding under logs within an hour after they were placed in the river. A project done in 2014 and 2015 added 730 trees to the stream channel from the confluence with Jordan Creek, which is just upstream from the old town of Bonanza, upstream to Eightmile Creek, a distance of about eight miles. 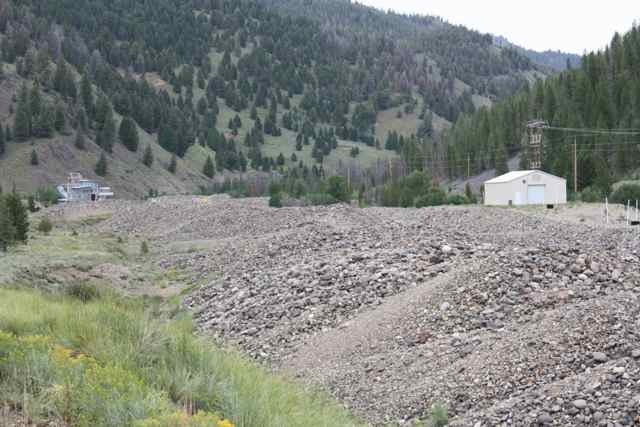 A second project this summer is taking place at the confluence of the West Fork near Bonanza. Gamett said miners relocated that stretch of the river and trapped it between a hillside and tailings piles. He said the project, which began in 2015 and will continue through 2017, is moving the channel back to its original location and adding wood. Trucks will be operating on the Yankee Fork Road between Sunbeam and Bonanza. The public is prohibited from entering either project area. The West Fork Confluence Stream Restoration Project has required the closure of two areas on national forest lands just east of the project area near Preachers Cove, between the Yankee Fork Road and the Yankee Fork. These areas are being used as staging sites for the large trees that will be used in the project and the closures are implemented for public safety. These areas, which have been marked on the ground, will reopen no later than Sept. 1. The ponds project will result in short traffic delays on the Yankee Fork Road while helicopters are working there. Those delays will generally be less than 15 minutes. Gamett said commitments by the project partners are in place to carry them into 2018, and three projects are under development. The largest is the Bonanza City Project, which will restore the floodplain for its entire width for a distance of about three-quarters of a mile. Gamett said that by 2018, the projects will have treated about 2.25 miles of the main stem of the river as well as some side channels, and added wood to a nearly half-mile section upstream of the dredged area. "We will have done at least some form of restoration over a substantial chunk of the Yankee Fork, and expect a good response on the part of the fish," he said. "Our efforts in the Yankee Fork demonstrate the tremendous good that can be accomplished when individuals and organizations come together, set aside their differences and focus on common ground." Gamett said restoration of the entire dredged area is unlikely given that it would probably cost hundreds of millions of dollars. "Even if it were possible, there's a need to leave at least some of those tailings intact as part of that region's history," he said. For additional information, contact Gamett at 208-588-3420.